Jean Logatto’s new book “If My Mommy Was an Octopus” is a delightful tale of a mother’s unbound love and dedication towards her family. 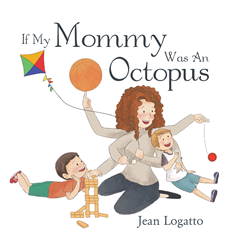 Recent release “If My Mommy Was an Octopus” from Page Publishing author Jean Logatto is both charming and fun; it tells the story of two brothers and learning a valuable lesson that will surely touch the reader’s heart. Jean Logatto, an inspiring mother to her two children, and an avid reader, has completed her new book “If My Mommy Was an Octopus”: a touching story inspired by her experiences of being a dedicated and affectionate mother. Published by New York City-based Page Publishing, Jean Logatto’s heartwarming narrative shows that mothers are the superwomen everybody needs in their lives. Despite having only two hands to do a number of difficult tasks, it cannot be refuted that a mother’s love is the best love of all. Readers who wish to experience this fantastic work can purchase“If Mommy Was an Octopus” at bookstores everywhere, or online at the Apple iTunes store, Amazon, Google Play, Kobo, or Barnes and Noble.